Hummingbirds pay no attention to what colour a flower is when figuring out whether to raid it for nectar, the latest research suggests. Instead, they seem to focus on flowers' exact location. The researchers who led the study say it's not that the birds don't see the colour of different flowers  just like us, they can see in colour throughout the visible spectrum. But location is a much more reliable source of information and overshadows any information provided by color. "Although this goes against what you might expect  after all flowers must be coloured for a reason  our finding makes perfect sense," says Dr. Sue Healy from the University of St Andrews, co-author of the study. "If they've fed from nectar-rich flowers before, that's a more useful guide to whether those flowers will contain nectar in the future than color is." Animals from dogs to butterflies and bees use color to help them work out if something is likely to be a tasty meal. So it's not too far-fetched to expect that the color of flowers could be important to hummingbirds too. Scientists have also noticed that the flowers that hummingbirds typically visit for food are often red. This led them to wonder whether this is just coincidence, or whether the birds prefer red flowers. "Their color vision is better than ours, so you might expect them to focus on it," says Healy. 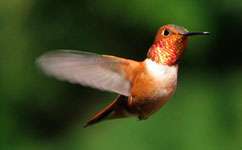 Other researchers have found that hummingbirds tend to prefer to use the layout of a field of flowers rather than their color when searching for food. But Healy and colleagues from the universities of St Andrews and Lethbridge wanted to know if they rely on color if it provides useful information on top of their knowledge about where to look for food. So, they presented hummingbirds with four different types of artificial flowers. Some flowers contained a 30 per cent sugar solution, while others contained just 20 per cent. They also varied how quickly the flowers refilled after the birds had taken their fill of sucrose. Some refilled after 10 minutes, others after 20 minutes. They found that seven of the birds took just 30 hours  during which they averaged 189 visits  to work out the difference between the fast-filling and slower-filling flowers. One remarkable bird managed to learn the difference within 50 visits. But they found that giving the birds clues about refill rates or concentrations using different colors made no difference at all to how quickly they learnt. "Ultimately, this suggests they ignore colour and just focus on location," explains Healy. Healy's own observations confirmed this when she had to move nectar-containing feeders to keep them away from bears in Canada in previous experiments. "Even though we only moved the feeders by 20 to 50 centimetres, the birds just didn't see them, because they weren't in the same positions they expected to find them. So they just flew away, which was quite a surprise." "I guess it's a bit like us in the supermarket. We know exactly where to look on the shelves and isles for our favourite products, which means that when the supermarkets move them, we have to really search to find them again," explains Healy. Different flowers vary in how much nectar they contain. This is true not just between species, but also on the same plant. "So relying on color to guide them isn't necessarily going to be the most successful strategy to get food," she adds. The study is published in Animal Behavior. Hate it when they do that. If only they would paint the aisles different colors per what they carry or something. Many flowers have invisible ultraviolet or fluorescent marks at their center and birds are known to perceive the ultraviolet light too in similar way like the pollinating insect - so I presume, the hummingbirds are using it for their navigation too. Actually it's quite strange, the authors of this study didn't analyze it in this context. Are they're halfeducated or what?